Representatives Katie Hill (D-CA-25) and Brian Babin (R-TX-36) recently introduced The Medicare Part B Fairness Act (H.R. 1788). The bill would limit the amount and duration of the Part B Late Enrollment Penalty (LEP). As well as expand the Special Enrollment Period for people with employer-sponsored coverage to other types of pre-Medicare coverage. To amend title XVIII of the Social Security Act to limit the penalty for late enrollment under part B of the Medicare Program to 15 percent and twice the period of no enrollment, and to exclude periods of COBRA, retiree, and VA coverage from such late enrollment penalty. Performs well on quality measures, including a national patient survey. Join us at Louis Bay public library in Hawthorne, NJ. Bring your questions and thoughts. Free event Saturday, March 23rd, starts @ 11 AM. If you will be entering the Medicare program and would like to use your benefits, it can be over whelming. Deciding when do I apply for Part A, Part B & Part D.
Your choices about your health care coverage is very important and to make an educated decision can be confusing. Come to explore what your options are and get your questions answered. If you have enrolled with Medicare already and beginning to receive information about the changes of your current plan, call us to discuss next year’s options. We can also review your options and choose the right plan for you. 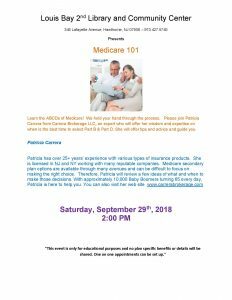 If you are just starting your Medicare now or looking into a future date. a different time than your friend’s or neighbor’s. card and start using your new card right away. providers, your insurers, or people you trust to work with Medicare on your behalf. Number. This new number is unique to you. taxpayers a lot of money. Plus, you can print your own replacement card if you need one! other health care facilities and providers will ask for your new Medicare card when you need care. provider may be able to look up your Medicare Number online. (1-800-633-4227). TTY users can call 1-877-486-2048. All people with Medicare are getting new Medicare cards. These new cards have a new Medicare Number that’s unique to each person with Medicare, instead of their Social Security Number. Medicare has started mailing cards to certain states and will continue mailing nationwide. Your new card will automatically come to you. You don’t need to do anything as long as your address is up to date. If you need to update your address, visit your mySocial Security account. Sign up to get an email when your card mails. What should I do when I get this card? Destroy your old Medicare card and start using your new card right away. Your Medicare coverage and benefits stay the same. Keep using your Medicare Advantage Plan ID card if you’re in a Medicare Advantage Plan, like an HMO or PPO. Carry your new Medicare card with you. Doctors, other health care providers, and facilities know it’s coming and will ask you for it. Join a Medicare drug plan when you’re first eligible.You won’t have to pay a penalty, even if you’ve never had prescription drug coverage before. Don’t go 63 days or more in a row without a Medicare drug plan or other creditable drug coverage.Creditable prescription drug coverage could include drug coverage from a current or former employer or union, TRICARE, Indian Health Service, the Department of Veterans Affairs, or health insurance coverage. Your plan must tell you each year if your drug coverage is creditable coverage. They may send you this information in a letter, or draw your attention to it in a newsletter or other piece of correspondence. Keep this information because you may need it if you join a Medicare drug plan later. Tell your plan about any drug coverage you had if they ask about it.When you join a Medicare drug plan, the plan will check to see if you had creditable drug coverage for 63 days or more in a row. If the plan believes you didn’t, it will send you a letter with a form asking about any drug coverage you had. Complete the form and return it to your drug plan by the deadline in the letter. If you don’t tell the plan about your creditable drug coverage, you may have to pay a penalty. The transition from group health benefits to Medicare is important but confusing. Currently, Medicare and Social Security are involved in determining what individuals will pay toward the cost of their Part B coverage. This confuses individuals not only on what they are told but on the timing on when information is sent to them. Nationally, more than 750,000 members are paying late enrollment penalties (LEP) and these penalties remain in place for as long as they are paying for Part B. As Medicare health plan advisors, we can help prevent costly enrollment mistakes when we facilitate a smooth transition into Medicare. It’s time to get educated! Many eligible members continue to work into their Medicare years until they are eligible for full Social Security benefits, currently at age 66. For this reason, group health advisors have the advantage of being the first respected and relevant influencer for a smooth transition to Medicare. We can help our clients make an informed decision about when to enroll in Medicare. Knowing when a member can and should enroll in Medicare A and B is just as significant as knowing when a member can and should enroll in an individual Medicare benefit as a stand-alone product. It is equally important to understand the Medicare Secondary Payer Laws. Who pays first — Medicare or the employer group health plan? There are many ways that we can facilitate a smooth transition into Medicare. Will your current health insurance pay all your final bills? What are my final bills? Who will pay all my final bills? Will my final expenses affect my estate? Family need to make decisions and accept final cost? Come join us for a lunch and learn. If you are looking to learn more, you must sign up for this meeting.